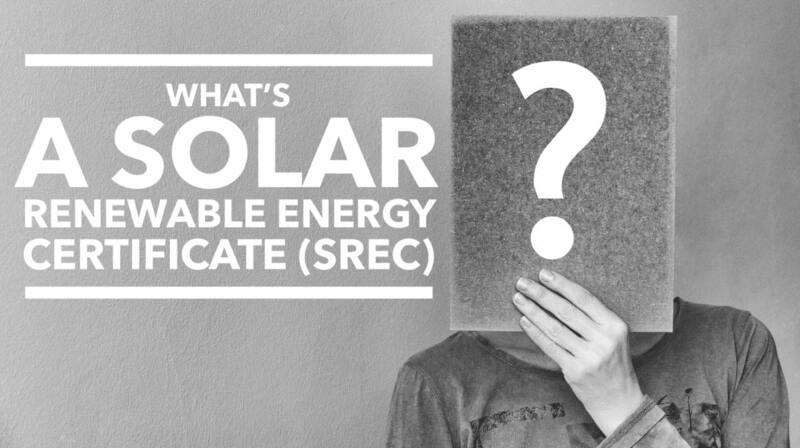 Q: What’s a solar renewable energy certificate (SREC)? The state of NJ provides each owner of a PV Solar system with an incentive to invest in solar. The incentive is in the form a Solar Renewable Energy Certificate or SREC. As the owner of the PV solar system, you are entitled to receive the SREC for 10-years from the time your system is officially connected to the grid. Think of SRECs as sort-of a byproduct of the solar energy that you create. Here's what we mean. As you create and consume the solar energy you produce, you are also generating energy towards the creation of SRECs. When you have generated 1000 kWh of solar energy, you are entitled to create one SREC. You get the SREC regardless of whether or not you consumed the solar energy that you produced. As long as the energy was created by solar it counts towards an SREC. On a quarterly basis, we gather your energy production data and enter it into PJM-EIS GATS. At the end of the month, the PJM-EIS GATS system generates serial number for each of your SRECs. Any energy over 1000 kWh gets carried over to the next period. As you SREC aggregator and broker, we take your SRECs along with thousands of others and put them up for bid to other aggregators and energy companies. We agree on a settlement price and send you a check after the transaction is completed. The settlement price is based on a number of things. The primary driver is the renewable portfolio standard (RPS) detailed below. Under the RPS, energy companies were basically given three choices: build their own solar, pay a fine (called the Solar Alternative Compliance Payment), or purchase an SREC. So, if the SREC value is cheaper than building their own solar or paying the fine, they are typically going to purchase the SREC. There are also supply and demand issues associated with how many SRECs are being offered -vs- how many are needed at a given time. SRECs exist as a result of a regulation known as the renewable portfolio standard (RPS). Renewable portfolio standards are state laws that require utilities to produce a specific percentage of their electricity from renewable resources such as solar and wind energy. Nearly 30 states and Washington, D.C. have an RPS, and eight states have a renewable portfolio goal. Electricity suppliers, the primary purchasers of SRECs, are required to pay a Solar Alternative Compliance Payment (SACP) if they do not meet the requirements of New Jersey’s Solar RPS. One way they can meet the RPS requirements is by purchasing SRECs. As SRECs are traded in a competitive market, the price may vary significantly. The actual price of an SREC during a trading period can and will fluctuate depending on supply and demand. SREC pricing reports can be downloaded at NJCEP. We like to look at cumulative weighted average SREC settlement prices as a way to gauge the current market and help predict future trends. How is the value of an SREC determined? New Jersey is one of the fastest growing markets for solar photovoltaics in the U.S. The success is due to New Jersey’s solar financing model, which relies on strong Renewable Portfolio Standards (RPS). The New Jersey Legislature passed new solar legislation in 2012 that accelerates the state’s Solar Renewable Portfolio Standard (RPS); extends the RPS to the year 2028; extends a SREC life to five years; and adjusts the Solar Alternative Compliance Payment (SACP), among other things. So, the RPS indicated the amount of solar that is required in each energy year and the SACP if the fine payment that the Energy Company must pay if they don't create their own solar power or purchase SRECs on the open market. The combination of the RSP, SACP and available SRECs on the market at a given time help determine the settlement price of the SREC. According to New Jersey's Clean Energy Program, New Jersey's Renewable Portfolio Standard (RPS) was first adopted in 1999 and has been updated several times. In May 2018, A.B. 3723 increased the total RPS requirement in New Jersey to 35% by 2025 and 50% by 2030 where the specified percentage of electricity sold in the the state must come from qualified Class I renewable energy sources. In addition, 2.5% of the electricity each year must come from qualified Class II renewable energy source. Prior to A.B. 3520 enacted in 2010, the solar carve-out was stated as a percentage-based target that, when combined with other resource targets, resulted in a total renewable energy standard of 22.5% by 2021. The January 2010 legislation adjusted the solar portion of the standard to be stated in terms of gigawatt-hours (GWh), resulting in a revised schedule requiring 17.88% from Class I and 2.5% from Class II renewables by EY 2021 (together 20.38% by EY 2021), and an additional 5,316 GWh from solar-electric facilities by EY 2026. In 2012 the solar compliance schedule was reverted back to a percentage-based target of 4.1% by EY 2028 by S.B. 1925. In May 2018, A.B. 3723 updated the standard by extending it to 2030. According to New Jersey's Clean Energy Program, if a supplier/provider is not in compliance for an energy year, the supplier/provider must remit an alternative compliance payment (ACP) and/or a solar alternative compliance payment (SACP) for the amount of RECs and solar RECs that were required but not submitted. The BPU determines prices for ACPs and SACPs, and reviews the prices at least once per year. The price of an ACP and an SACP is to be higher than the estimated competitive market cost of (1) the cost of meeting the requirement by purchasing a REC or solar REC, or (2) the cost of meeting the requirement by generating the required renewable energy. A.B. 3723 enacted in May 2018 added a ceiling price for the SACP such that the cost does not exceed 9% of the total paid for electricity by all of the customers in the state for year 2019, 2020, and 2021 respectively, and does not exceed 7% of the cost for following years. How do I generate SRECs? The Clean Energy Act, signed by Governor Murphy on May 23, 2018, included the following provision: "For all applications for designation as connected to the distribution system of a solar electric power generation facility filed with the Board after the date of enactment of P.L. 2018 c. 17 (C. 48:3-87.8 et al.) the SREC term shall be 10 years." L. 2018, c. 17, 2(d)(3). On October 29, 2018 the New Jersey Board of Public Utilities clarified the language above as follows: NJ SREC Update: Implementation of New 10-year SREC Term. Solar system owners can choose to sell their SRECs to a broker, aggregator, or Load Serving Entity (LSE) i.e. the electric suppliers and providers, who must buy SRECs to meet their RPS obligations. Some solar installers or project developers will offer to buy the SRECs as part of the project financing, thereby reducing the installation costs and hence the amount of capital needed up front to finance a project. All customers considering financing options for a solar installation should ask their installer about the value of SRECs and who will have the rights to claim them. New Jersey’s Electric Distribution Companies (EDCs), who provide regulated electric transmission and distribution services, offer solar finance programs that provide competitive long term contracts for SREC off take or loans in exchange for the SREC amortization. The SRECs procured under each model are auctioned to buyers for use toward NJ RPS compliance by electric generation suppliers and providers. How do I sell my SRECs? Solar system owners can choose to sell their SRECs to a broker, aggregator, or Load Serving Entity (LSE) i.e. the electric suppliers and providers, who must buy SRECs to meet their RPS obligations. Green Sun Energy Services, manages, aggregates and sells SRECs for our clients. What happens to my SRECs if I move? We advise our clients to transfer the rights to their SRECs when the sell their house, and many of our clients use this as a negotiating tactic when trying to sell their property for more money. That said, if you sell your house while there is an active SREC market in your state, you retain the rights to sell your system’s SRECs even after moving. That means that, even if you sell your home, you could still receive income from the solar panel system you installed for years after. Please click on Get an Estimate for details on how many SRECs you can produce and how much "going solar" can save you.